You might find this hard to believe. After all, you’re paying more than double what your friends tell you it costs to keep a horse. But when your friends tell you it only costs a little over $100 a month to keep a horse at home, they’re thinking about how much it costs them to feed and shoe their horses. Maybe they’re even factoring in normal veterinary costs and bedding for their horses’ stalls. How could boarding not be sufficient for stable management success? But they’re forgetting, of course, a host of other costs related to stable management success, such as the mortgage, utilities, water (and sewer or septic costs), grounds-keeping, fence repair—just to name a few. Where does their money come from for these things? Their jobs. Their horses are recreation for them. For you, they will be your job and your major source of income. Ask them how much it would cost them to live if they had no job and all of the things mentioned above had to be paid for out of the income brought in by the horses on their property. How much would they have to charge per horse? You might see a “deer in the headlights” look come over their faces. In most geographic areas, boarding costs don’t cover the cost of all of those things. Unless you inherit your horse property, you will have a mortgage to pay. If you have lights in your arena, use heaters in your water troughs, or heat your barn, your utility costs will be very high. That will be in addition to heating and lighting your home. Unless you plan to board very few horses, you will need additional help for stall cleaning, arena grooming, horse handling, and pasture management. All of these things will have to come out of the income your business provides. And that is why stable management success depends on your having other lines of income into your horse business. That’s where the bulk of your income will come from. Let’s focus on the first two of these because horse breeding and sales can be more of a challenge than the other two. ORSE TRAINING AND STABLE MANAGEMENT SUCCESS. Horse training and horse riding lessons are, hands down, the most profitable aspects of any horse business. This is how your horses contribute significantly to your stable management success. But these things require expertise. People usually put their horses in training for three reasons, and usually in this order: (1) Their horse has become a problem for them, (2) their horse has not yet been started (a “green” horse), or (3) they are not progressing in their horse competition goals and think their problem is their horse. Do you have the expertise to train horses? If your experience comes mostly from owning and showing your own horses, you may think you do. But have you ever done beginning horse training—that is, trained green or young horses? Believe me, this is a very different situation than training a “made” horse—a horse that has already been started under saddle and perhaps been ridden for a year or two. Have you ever trained problem horses—horses that may even be dangerous? If you’re already successfully done these things, then you are in a great position to hang out your shingle as a horse trainer and experience some real stable management success. And if you’re good at what you do, people will flock to you. It’s a truism that more people have horses than can ride them safely and successfully. They need you and your expertise to help them achieve their horse riding goals! RIDING LESSONS AND STABLE MANAGEMENT SUCCESS. Horse riding lessons are equally important. It doesn’t much matter how well the horse is trained if the rider is unstable or lacks riding experience. There is nothing more disappointing for a trainer than to spend months training a horse and then seeing all that training disappear with a few weeks of returning home to the horse owner. It happens frequently, believe me. So when you take a horse in for training, ALWAYS include at least weekly riding lessons in your training fees. Not only will the horse be happier, but the horse owner will be as well because your training will “stick”. What does it take to be a good instructor? A stellar ability to communicate what you know, and the patience of Job. Some of the worst riding instructors are also the most gifted riders and trainers. That’s because all of their knowledge is implicit—it’s in their muscles. They often can’t verbalize what they’re doing under saddle or during ground training because it comes naturally to them, and hence isn’t available for conscious reflection and verbalization. To be a good instructor, you will need to develop a tool kit of words, phrases, images, and demonstrations that allow you to communicate what you know. 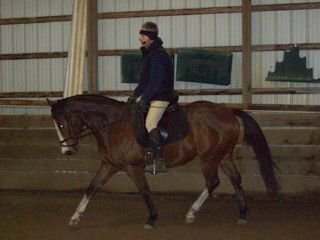 ARENA RENTAL: Many people have horses at home but nowhere to ride them during the winter or in rainy weather. They will gladly pay a nominal fee to ride in your groomed and lighted indoor arena. CLINICS: These appeal to horse riders who want to compete in shows. To make these profitable, make sure that the clinician focuses on riding skills, tips, and techniques, that appeal to your clientele. Then add a fee on top of their fee for use of your facility. SHOWS: These usually fall into rates shows and schooling shows. They require a good deal of organizational work to put on, but can be worth the effort not just in terms of the income realized for the shows themselves, but for getting horse riders into your facility to see what you’ve got to offer. Shows can be great “open houses” for advertising your business. SALE OF HORSE-RELATED PRODUCTS: If you can arrange to sell horse related products from your business (or on-line), this can be a lucrative source of income for your business. These products might include feed or nutritional supplements, horse grooming supplies, horse jewelry, or tack items. If you keep these things in mind when starting your horse business, you will be well on your way to stable managment success! Here are three books that I highly recommend for horse business owners. I also recommend QuickBooks for keeping track of board payments, bills, and many, many other aspects of stable management.